Today should be great save the pains I had. The pains were not too bad but it kept me irritable and inactive. It was a church member's wedding and I could do nothing beyond the ordinary to help in service and arrangements. I did not do any deliberate workout today because there was just too much to do within a little time. So after this post, I will be going to have my daily 5 mins jump rope interval dose, (I loved the streak). I have been doing it and I have been enjoying it and who knows 5 minutes becomes 10 mins and on and on. 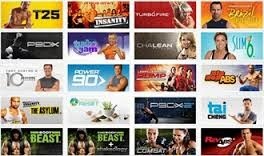 I have a new crush on beachbody.com and trust me I am loving every bit of it. Unlike fitness blender who normally have it slow but intense, beachbody has it fast, furious and insanely intense. Unfortunately, getting to download on YouTube is almost impossible because their videos are not even there, my bad. In my commitment to beachbody.com, I had some wonderful time with this man last night, and by the time he finished with me in 34 minutes, I glowed in my own sweat. Below are the other challenges in beachbody, I will try to get most if not all of this as the days goes by. Meanwhile, I am still committed to the other sites like gymra, fitnessblender, befit etc, they all have their place in my heart including my jump rope. Lemme do this before I change my mind.